Solar ovens are an efficient, environmentally friendly way to cook for families, groups, communities and institutions. Find out how solar ovens are being used to save the world, the environment, and important limited resources. Many people around the world are turning to solar to reduce energy costs and their carbon footprints on the environment. While some are investigating the new and improved solar panels to reduce their need for electricity in the home, others are taking smaller but still very important steps like installing solar skylights. Going green and going solar isn’t limited to solar panels or solar skylights. Solar ovens allow people to cook green out in the green outdoors. Solar ovens aren’t a new idea but they are getting a lot of new attention around the world. Solar ovens, also called solar cookers, are instruments that use sunlight as the energy source for cooking. There are many variations from permanent to temporary or ready- made to kit or scrap built. The basic materials in any solar oven will be a type of reflective metal to concentrate light from the sun and a clear solid such as plastic, even a plastic bag, or glass to allow light to enter and the trap heat inside. -Solar ovens require no fuel and operate without depleting any energy sources. -Solar ovens cost nothing to operate. -Solar ovens mean no standing over a stove or burnt food. -Solar ovens can be used for outdoor cooking in areas where using fire for cooking creates a high fire risk. In developing countries where using fire to cook is common, solar ovens can reduce respiratory illnesses due to long term exposure to air pollution. For these many reasons, solar ovens are becoming popular again. In China, several hundred thousand parabolic cookers are being used. Parabolic cookers are a unique form of solar oven that reaches high temperatures and cooks quickly. Unlike many forms of solar ovens, parabolic cookers are difficult to construct, require frequent adjustment and careful supervision for safety. These are mainly used for institutional cooking on a large-scale. 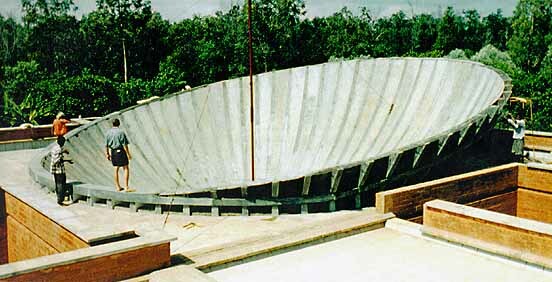 The Solar Kitchen in Auroville, India uses a unique solar bowl to prepare over 1,000 meals a day. The solar bowls use a stationary spherical reflector to focus light and produce steam at 150 degrees C.
Bysanivaripalle, India, which is a silk-producing village, uses solar cooking only, to support the entire village. Michael Hones, the “African Can Man,” moved to Lesotho, South Africa, from Germany and found inspiration in a soda can. “The can is a valuable waste material because it is a high-tech product-it’s durable, lightweight, a hollow building block,” he says. “At first I wanted to save energy, so I designed a more efficient wood-burning stove out of the cans. Then I designed chairs and tables to sit on around the fire.” Hones went to the Ubuntu Village at the World Summit on Sustainable Development in September of 2002 (Johannesburg), where he ran a popular restaurant with a kitchen and dining area made entirely of soda cans, and a menu of food cooked on solar cookers, which he also designed. Next on his agenda: housing for HIV orphans, made from discarded cans. He has already lined up donors and support from the German government for a village of can houses with solar roofs. Of course not all solar ovens are fancy or institutional. Solar ovens are being used in developing countries to save lives. Solar ovens are not only being used to cook food but also to pasteurize water. Over 10,000 solar ovens made from aluminum foil, cardboard and plastic bags are saving lives. 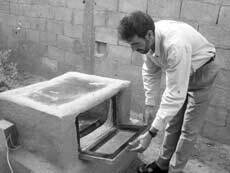 The refugees construct the solar ovens from the donated supplies and use them to prepare midday and evening meals. The goal of the project sponsored by the Solar Cookers International, Jewish World Watch and the Dutch foundation KoZon, was to protect the Darfuri women who would have otherwise had to leave the relative safety of the camp to gather firewood, which exposed them to the risks of being beaten, raped, kidnapped or murdered. An added benefit for the refugees is that if the women spend less time tending to fires they have more time to grow healthy vegetables and make handicrafts that can be exported to further support their families. As the siege of the Gaza Strip in Palestine left families without fuel, about 45 Palestine households constructed solar cookers from cement bricks, straw mixed with mud, and sheets of glass. In Kenya, CooKit kits are being used to cook food and clean water. In many areas like this where fuel (like wood) is scarce and requires long walks to obtain, people use the limited fuel for cooking rather than to boil water. Drinking contaminated water causes death and illness for millions of people annually. Resources that aren’t spent on fuel can be used to provide food in Kenya and around the world, variations of solar ovens are saving countless lives as well as resources. Solar Cookers International is nonprofit organization that teaches people how to make and use solar cookers. 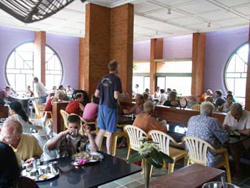 In 2006 Solar Cookers International was the winner of the World Renewable Energy Award. Solar ovens are more than just an easy, affordable way to go green and save resources. Around the world, solar ovens are saving communities and saving lives.